If you’re the type of traveller that wants to connect with a place and its people or you enjoy the nostalgic journey through time, then the Wonders of Wynyard Visitor Information and Exhibition Centre is a must-see on your visit to Tasmania. 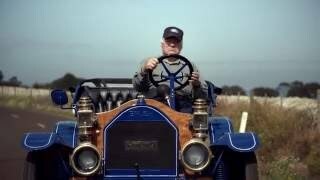 The Wonders of Wynyard is home to the world class Ransley Veteran Car Collection with over 14 vehicles including the equal oldest Ford in the world – the 1903 Model A. The collection has been lovingly restored and is an outstanding showcase of Australian motoring history. Visitors to the Wonders of Wynyard can immerse themselves in local heritage, including stories detailing the fascinating maritime history and unique geographical landmarks of the region. The Wonders of Wynyard’s art gallery exhibits local artworks – the perfect place to purchase a special memento of your holiday. We all know the best way to get to know a place is by asking a local, and visitors to the Wonders of Wynyard can be sure of a warm and friendly welcome. Conveniently located in the centre of town, with long bay parking facilities, gift shop and friendly advice, the Wonders of Wynyard is the perfect place to discover the stories behind the scenery.